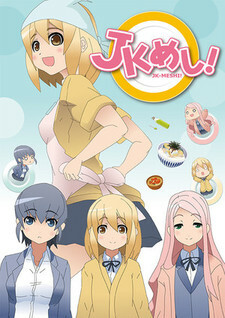 An anime about high school girls who have mastered the art of cooking simple, B-class dishes called JK meshi. The three girls — Reina, Ryouka, and Ruriko — are all classmates in their second year of high school. They often get distracted when studying for tests, and when they do, they cook JK meshi. The anime will show how to cook these dishes by showing common ingredients, and simple, easy-to-copy steps so that viewers can also try making the dishes.